Prof. Jim Al-Khalili’s fascinating program The Secrets of Quantum Physics, from BBC Four, included a particularly intriguing section on Quantum Biology. In the second episode in the series, Let There be Life, he explains the “vibration theory of olfaction”, and he does it so eloquently and coherently (and beautifully!) that even I could grasp the general idea. I am no Quantum Physicist or Biologist – far from it – but it is a fascinating theory that explains why, of all the senses, smell and hearing are so oddly related. His explanation starts at 0:14:23 in the video. Transcript: “Our sense of smell is remarkable, and quite different from our other senses of sight and hearing. Among the thousands of scents that we can recognize, many of them may well trigger very powerful memories and emotions. 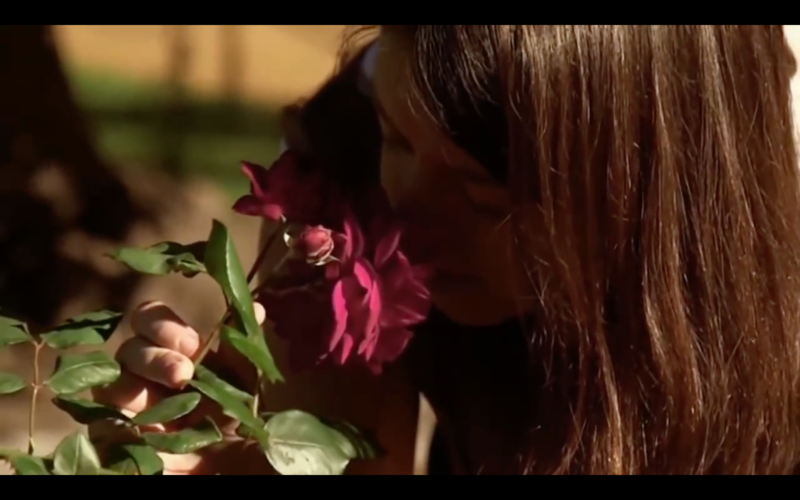 It’s as though our sense of smell is wired directly to our inner consciousness. It’s also different in another way. 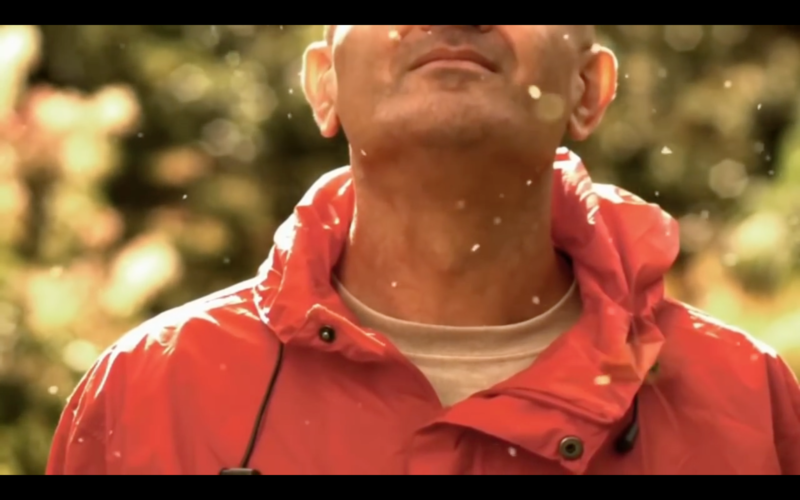 The other senses of sight and hearing rely on us detecting waves – light and sound. But our sense of smell involves detecting particles – chemical molecules. “Recently, scientists [like Luca Turin] have begun to realize that when it comes to our sense of smell, something very mysterious is going on. For decades, biologists thought they knew exactly how our noses work. When our noses detect a chemical, they fire a nerve signal to our brains. But different chemicals create different sensations. The standard explanation for this is to do with the shape of the molecules. The conventional theory that goes back to the 1950s says that the scent molecule has a particular shape that allows it to fit in to the receptor molecules in our nose. If it has the right shape, it’s like a hand in a glove, it’s called the lock and key mechanism. With the wrong shape, it won’t fit into the receptor. But with the right shape, it fits into the receptor, sensation. “Different receptors are wired to different parts of our brains. So, when a menthol molecule locks into its specific receptor, it triggers that minty fresh sensation. But the lock and key theory has always had a problem. 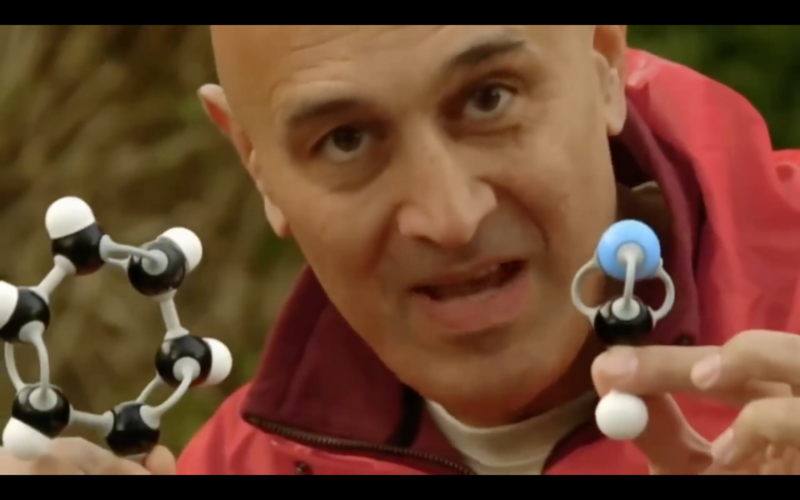 […] Why would two molecules with different shapes smell the same? Quantum biology has a head-spinning explanation. “It says our noses aren’t smelling chemical molecules… ..they’re LISTENING to them. It’s not just the shape of a scent molecule that matters. You see, atoms don’t just sit still. The bonds that hold them together are like vibrating strings, and that gives us a whole new way of thinking about smell. The bizarre new quantum theory of smell is all about vibrating bonds. Chemical molecules are playing music for our noses. 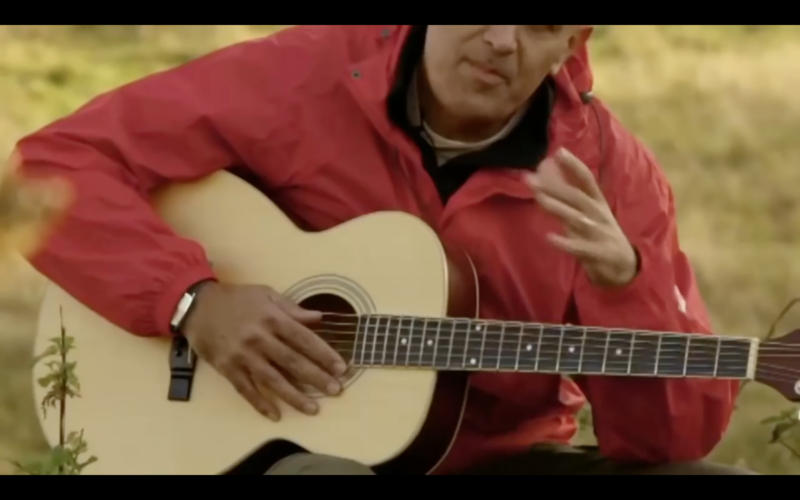 Imagine a receptor molecule in my nose is like my guitar. Before it can make a sound, a scent molecule has to enter my nose, and when that scent molecule is in place, its chemical bonds provide the strings, and it’s ready to be played. The receptor molecules contain quantum particles – electrons. As they leap from one atom to another, they vibrate the bonds of the scent molecule, like my fingers plucking a guitar string. “What’s remarkable about this theory is that it tells us the vibrations of molecules, or wave-like behaviour, and not so much about the shape of a particular scent molecule. Our sense of smell may be much more like our sense of hearing. “A particular molecule, say that of grass, will vibrate at a particular frequency. But a different molecule, say, that of mint, will vibrate at a different frequency. This would explain [for instance] why cyanide smells like almonds. The two molecules have different shapes, but their chemical bonds just happen to vibrate at the same frequency. “The constant vibration in the odorant is almost literally like a particle of sound. So, we’re saying that the process of smell could be exactly like an acoustic resonance event, it could be very analogous to hearing and seeing, actually. “The […] quantum smell theory really works. But ultimately, it works in harmony with the lock and key theory. First, the scent molecule fits into the receptor… ..then those molecular vibrations take over. 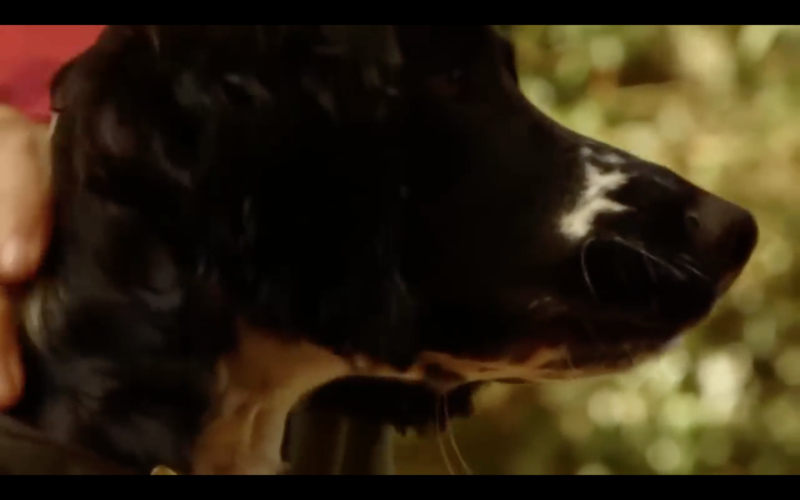 Incredible as it seems, flies, humans and dogs may be smelling the sound of quantum biology. Dogs possess up to 300 million olfactory receptors in their noses, compared to about six million in us. And the part of a dog’s brain that is devoted to analyzing smells is, proportionally speaking, 40 times greater than that of a human. This theory, called the Vibration Theory of Olfaction, was first proposed in 1996 (and is still being developed), by biophysicist and perfume researcher Luca Turin. “You see, when you’re a scientist, you’re always selling ideas. And people are very resistant to ideas, and rightly so. Why should new ideas be accepted? But when you put a little 10-gram vial on the table in front of perfumers and it smells like coumarin, and it isn’t coumarin, and you’ve found it in three weeks, this focuses everybody’s mind wonderfully. And people often ask me, is your theory accepted? And I said, well, by whom? “I mean most, you know — there’s three attitudes: You’re right, and I don’t know why, which is the most rational one at this point. You’re right, and I don’t care how you do it, in a sense; you bring me the molecules, you know. And: You’re completely wrong, and I’m sure you’re completely wrong. […] Now, we’re dealing with people who only want results, and this is the commercial world. And they tell us that even if we do it by astrology, they’re happy. But we’re not actually doing it by astrology.